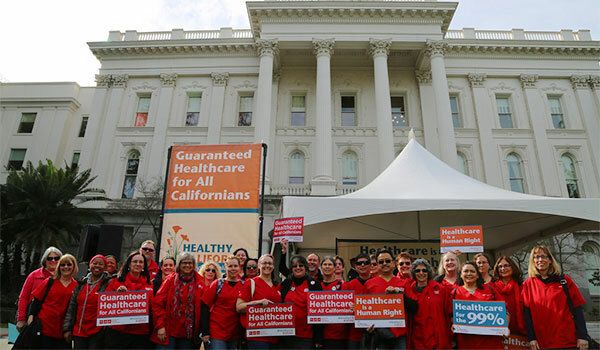 CNA RNs rally for the Healthy California Act at the State Capitol. A payroll and income premium, which is higher for upper income earners, would replace insurance company premiums, co-pays and deductibles—likely resulting in significant out-of-pocket net savings. Provider rates will be negotiated to ensure access, cost control and high-value services. Huge cost-savings from reduced bureaucracy. No more insurance company run-around. No more bill collectors. AB 402 (Thurmond): The heat-generated (thermal) destruction of human tissue via cutting during therapeutic removal and burning (cauterization) is commonplace in a wide range of medical procedures. When human tissue is destroyed in this way, a smoke byproduct or “plume” is created. The plume can contain toxic gases and vapors such as benzene, hydrogen cyanide, and formaldehyde, biological aerosols (a suspension of living bacteria, viral particles or fungal spores), and viruses and blood fragments containing blood borne pathogens, including multi-resistant strains. Surgical plume is also known to contain mutagenic (cancer producing) particles. One study equated the mutagenic condensate generated from one gram of tissue to three cigarettes from lasers and six cigarettes for electrocautery smoke. At high concentrations, plume is also known to cause ocular and upper respiratory tract irritation in health care personnel. Warnings that healthcare providers face a risk of occupational transmission during laser removal of warts because of exposure to smoke containing viral particles of the easily transmissible papilloma virus (warts) has been known for a very long time. AB 402(Thurmond) is needed because it will direct CalOSHA to develop the appropriate standard to evacuate harmful surgical plume smoke. The legislation will prove to be a benefit to both health care personnel and their patients. California Assembly to Consider Legislation to Reduce Toxic "Plumes"
SB 1076 (Hernandez): More and more, hospitals are placing patients who cannot be safely discharged to their homes in “observation units” as an alternative to hospital admission. In these settings, patients are sometimes placed in this setting for prolonged periods of time. Many patients are not aware that they are in observation, leaving them to believe they are admitted as inpatients. This is especially concerning for patients who may need to be discharged to a long-term care facility, as Medicare requires patients to be admitted as inpatients for three days before coverage for long-term care will kick in. However, time spent in observation does not count, as observation services are outpatient services. SB 1076 (Hernandez) would requires observation services to meet the same staffing standards, including licensed nurse-to-patient ratios, as emergency rooms, requires hospitals to provide notice to patients that observation services are “outpatient” services and third-party reimbursement may be impacted and last, requires hospitals to report observation services to the Office of Statewide Health Planning and Development. Nurses fought long and hard for nurse-to-patient ratios because nurses care for their patients. Listen as RNs who were directly involved in the struggle for ratios talk about the fight, and the excitement of winning one of the landmark patient gains in the country…and the ONLY patient ratios law in the United States. Governor Gray Davis signed ratios into law in California in 1999. They were finally implemented in 2004 after a long fight to win safe staffing and quality patient care. Nurses even took on Gov. Schwarzenegger and won. Their story of persistence in the face of adversity is one of the great political tales of our time. Find out more about CNA/NNOC/NNU's National Campaign for Safe RN-to-Patient Staffing Ratios.